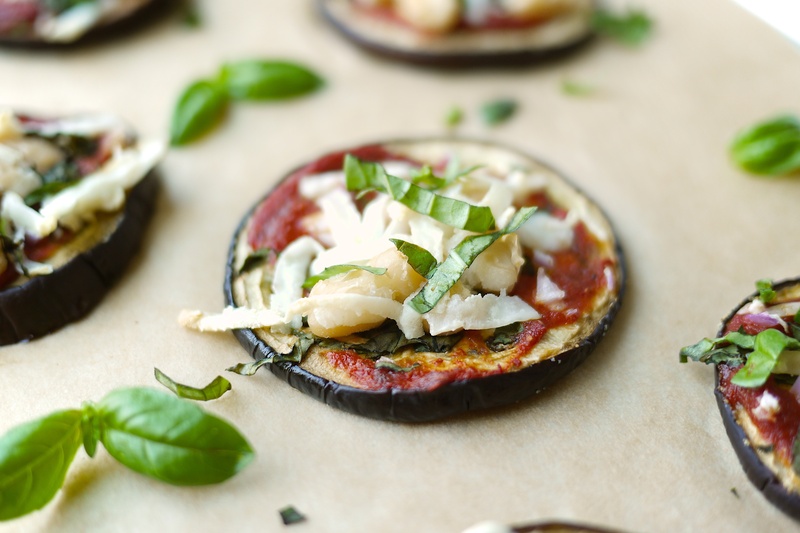 If you’ve come here looking for a way to love eggplant, you’re in the right place! I have to admit, I’m a finicky eggplant eater. I only like ‘em just so. Not too thick, not too thin and rubbery. 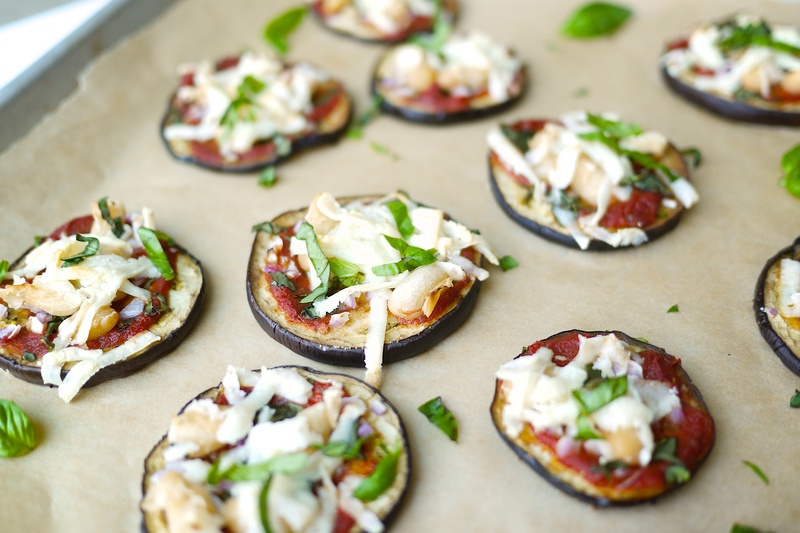 These cute, little eggplant mini pizzas are just right. And, I gotta say, much better than the microwavable mini pizzas I grew up with. Like most fruits and veggies, most of the nutritional benefit in eggplants is found in the deep purple skin. 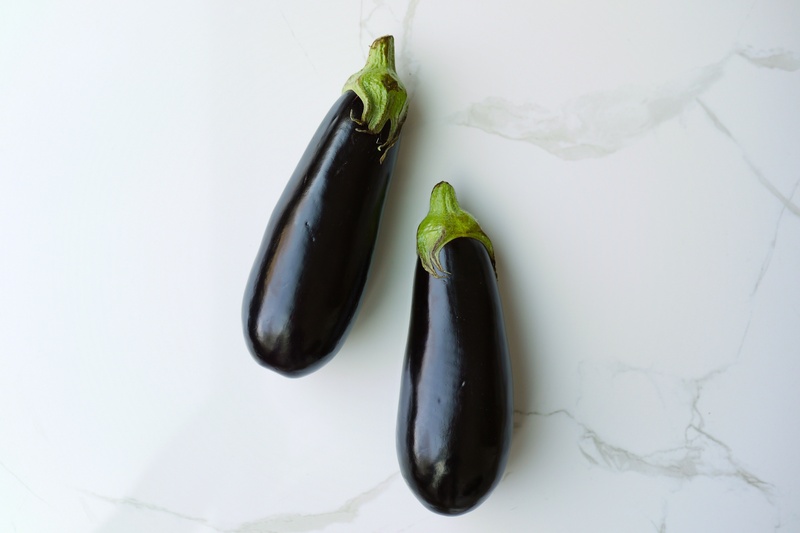 It’s even more important to note with eggplants because the skin is where you’ll find all the powerful antioxidants called anthocyanins hanging out. Antioxidants are so important for protecting our cells against free radical damage and anthocyanins are particularly good at their bodyguard role (especially in the brain!). They’re super anti-inflammatory and help us stay healthy and fight disease. Antioxidants also slow down the aging process. Yay! Pre-salting the eggplant and letting it sit for about 30 minutes before baking will help draw our excess water and help with the texture as well as remove any potential bitter taste you might encounter with an eggplant. (This is not a necessary step, though). 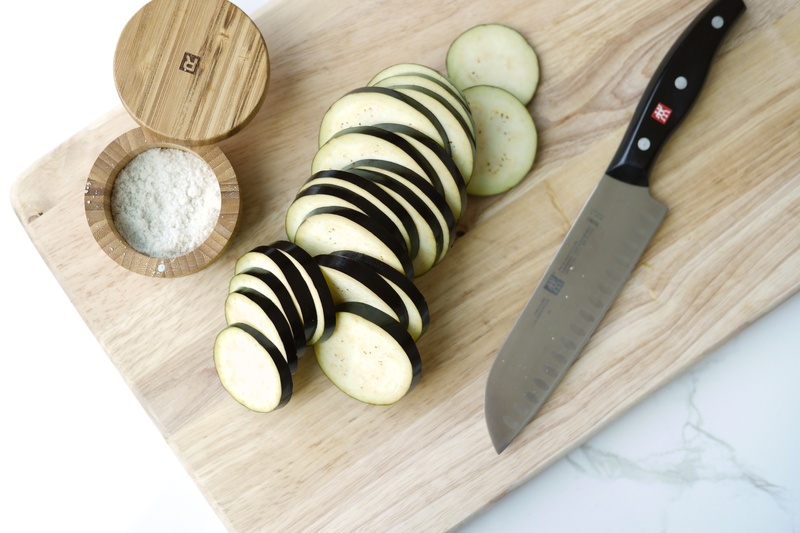 If you’re pre-salting, make sure to rinse well and blot eggplant discs dry with a clean tea towel. 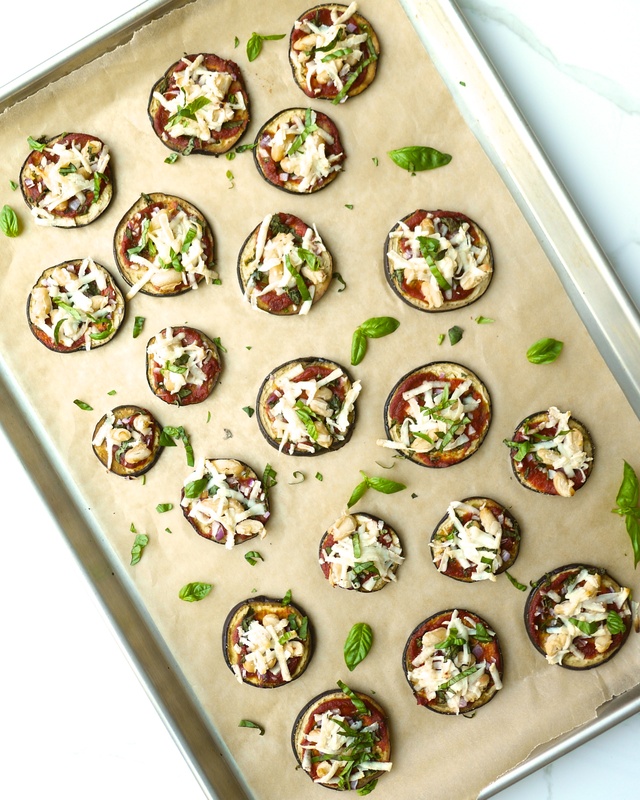 Pre-baking the eggplant discs before topping them with pizza toppings is the best way to ensure they’re cooked properly without overcooking your toppings. I used goat mozza here, but goat cheese doesn’t melt as well as cow cheese, so if you’re looking for more melty cheese, stick with organic cow mozza or white cheddar (if you can “do” cow dairy”). If you’re vegan, simply omit the cheese. It’ll still taste like a delicious pizza. Top it with anything you like! Sliced black olives would be amazing! Preheat oven to 425F and line baking sheet with parchment paper. Rinse salt from eggplant and pat discs dry with a tea towel. Brush eggplant slices with oil, light sprinkling of salt (if skipped the pre-salting step), arrange evenly on baking tray. Bake eggplant discs for 15 minutes. Meanwhile, mince onions + chop basil. Mix oregano + garlic + salt into tomato paste. Stir to combine well. Spread tomato paste mixture on all rounds, then top with onions, 2 tbsp chopped basil, beans and shredded cheese. Place pizza rounds back into oven and bake for another 5-8 minutes, or until cheese is melted. Garnish with remaining 1tbsp fresh basil slices. 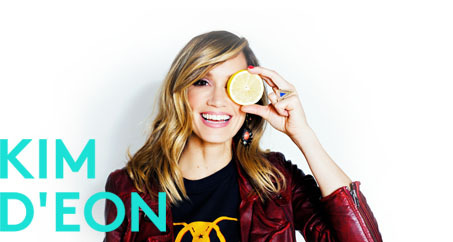 You know I love seeing what you’re up to in your own kitchen, so if you make this recipe, please tag me @kimdeoncom so I can see your healthy creations! Now, go have a pizza party! Recipe inspired by the gorgeous Nadia Felsch!